Actually, I’m more of a ‘messing around with words and ideas’ kind of writer than I am a natural storyteller. I’ve had to learn how to shape a story; for me, that’s hard work, but also very satisfying. I do love story, though, and I suspect that comes from my own childhood, in which I was surrounded by books of all kinds. Why do you write for young people? I have very vivid memories of childhood, and in particular, of what it felt like to be a child at various ages. I feel very close to my childhood self and so it’s natural for me to want to write from that experience, and for those age groups. I also remember very clearly how important books were for me when I was growing up and it feels like an absolute privilege to create that for others – to make a world or a character or just a little piece of whimsy a child can disappear into for a while, or something that sets them thinking about things in a new way. It’s almost always about language for me. I loved the poetry of AA Milne – collections such as When We Were Very Young and Now We Are Six, with their wonderful ‘Bad Sir Brian Botany’ and ‘The King’s Breakfast’ and so many more. Also Hilaire Belloc’s glorious Cautionary Tales for Children with its delicious, rollicking naughtiness. As a writer, what would you choose as your mascot or avatar? The rhinoceros illustration by Leila Rudge from our picture book Once Upon A Small Rhinoceros. Because the small rhinoceros is quietly fabulous and looks as one little boy put it, ‘all fizzed up’, and something about this captures what it feels like when the writing is going well. I can’t say that I’m really into pilgrimages, but I often visit the Fremantle home of illustrator and writer duo Frané Lessac and Mark Greenwood and that feels like the next best thing! What looks like mess is actually your method. Don’t panic! I’m told there is a distinctive ‘Meg McKinlay voice’. While it’s difficult for me to hear this myself, I think I put particular emphasis on language – on its rhythms and cadence, the way words slot together, the way they sound when read out loud. This is wonderful for poetry and picture books but makes me a very slow writer of novels! Think and dream and mutter about writing! I’m always sorting words and sentences in my head. Apart from that, I like to read, walk, swim, garden, and do a little bit of nothing every now and then. From both everywhere and nowhere, in the sense that creative possibilities are all around us but I don’t really think of myself as ‘getting ideas’. I’m just constantly gathering fragments, little bits and pieces that catch my eye as I move through the everyday, and spinning questions around them. What we think of as ideas eventually spin out of that process. This is a hard one! The truth is nothing is ever finished in my head. Even when I read my long-published work to audiences, I have to resist the urge to tinker as I go. I guess I can say that when I write, even though I never know how are books going to end, I always know the feeling I want to leave the reader with, so once I’m satisfied I’ve achieved that, I’m generally happy to let go of things. Want to see Meg at the festival? 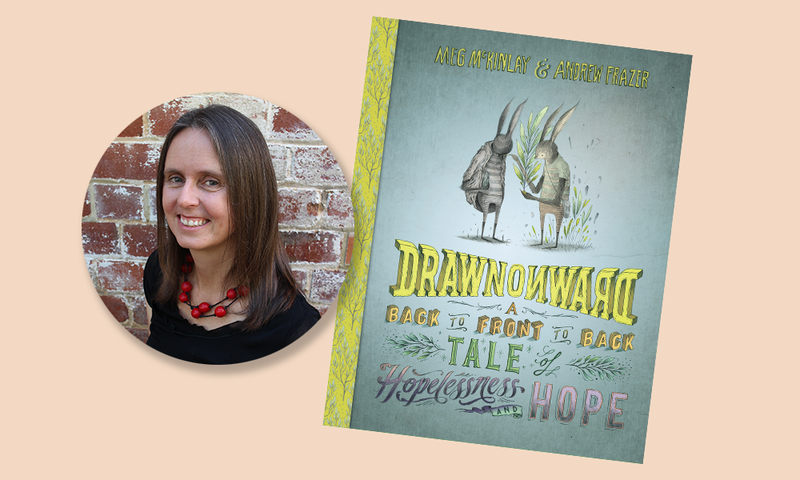 Be sure you catch Meg’s session, Drawn Onward, on Saturday 12 May and drop-in to The Goods Shed across our Family weekend and help Meg upcycle old books into Haiku poetry.